Spiral Rhythms was performed on 10-11 December 2010 at the Carriageworks, Sydney. 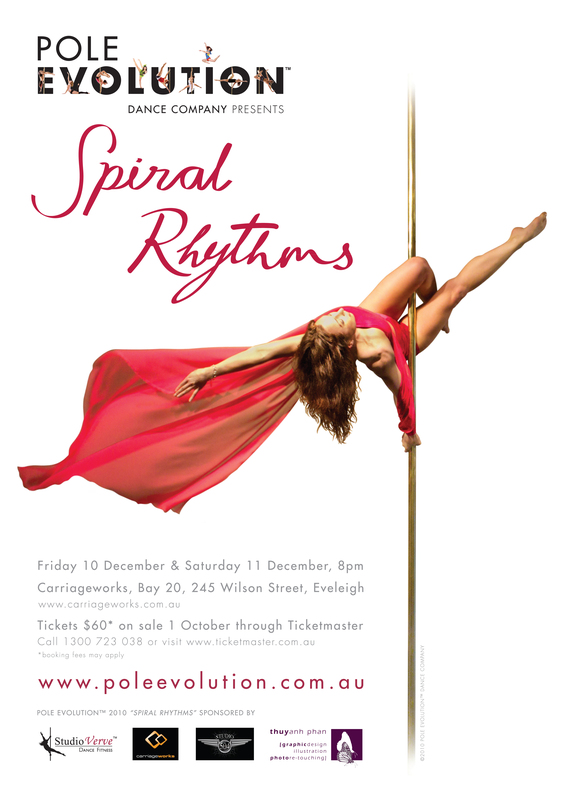 Pole Evolution™ Dance Company, Sydney’s first and only pole dance company, is proud to present Spiral Rhythms – a spectacular show that celebrates movement, music and dance and will inspire you with the passion, power and charisma exuded by the athletic company dancers. Spiral Rhythms is a unique fusion of pole dancing with classical ballet technique, raw contemporary dance and pure gymnastics. Featuring a high-energy soundtrack that will get under your skin and have you tapping your feet and grooving long after the show is over, Spiral Rhythms will also take you on a musical journey with contrasting styles from beginning to end, but with a powerful rhythmic thread that runs the whole way through. Founder, Director and Principal dancer of Pole Evolution™ Dance Company, Jennifer Critelli is thrilled to be bringing together this company of 20 talented and gutsy dancers for what will undoubtedly be a dynamic and compelling dance experience. Spiral Rhythms is like nothing you’ve ever seen before and it is an unforgettable experience that is not to be missed.